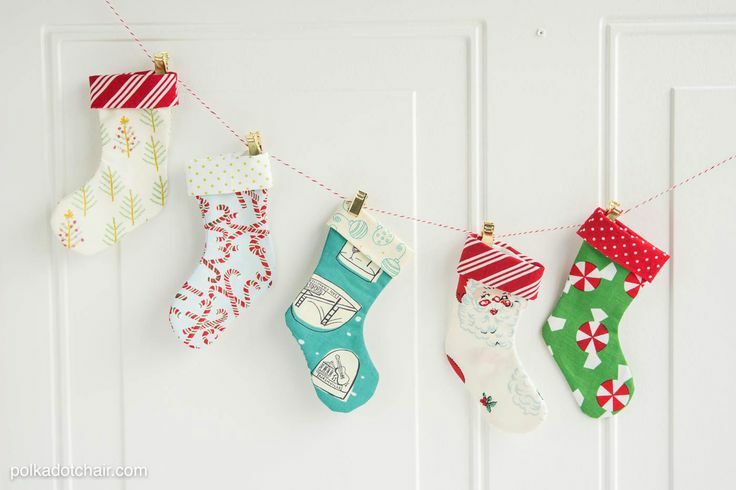 Christmas stockings play an important role when it comes to festive decorating of the house. However, instead of going for the same old red and white stockings, we suggest you create something more out of the box and come up with such creative and pretty stockings! In this article you will find ten DIY ideas that are equally beautiful (if only we could make all of these at home! ), but require different skills and materials. So, don’t worry if you don’t know how to sew – there are stockings for you too and of course, the same applies for those of you who love sewing! Pop art lovers, gather! When you feel like wall art isn’t enough, for Christmas you can even have the stockings inspired by this art movement. The most important thing is to find the right pattern for the stockings. So, for this project here’s what you need – furry pattern fabric or another fabric you’d like, velvet scraps, tailor’s chalk or marker, scissors and sewing machine. There’s something about pom poms that makes them so irresistible! 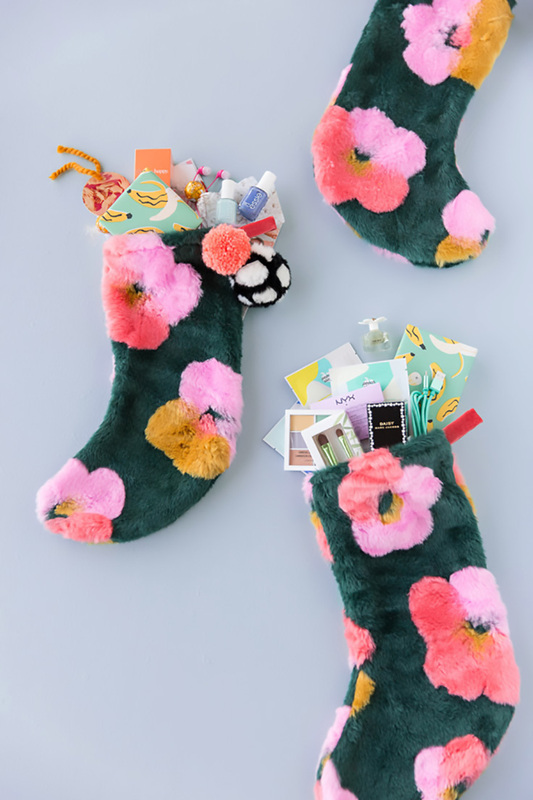 This kind of stockings are ideal for those of you who like all things pom pom and when it comes to this project, it’s literally pom poms all over. 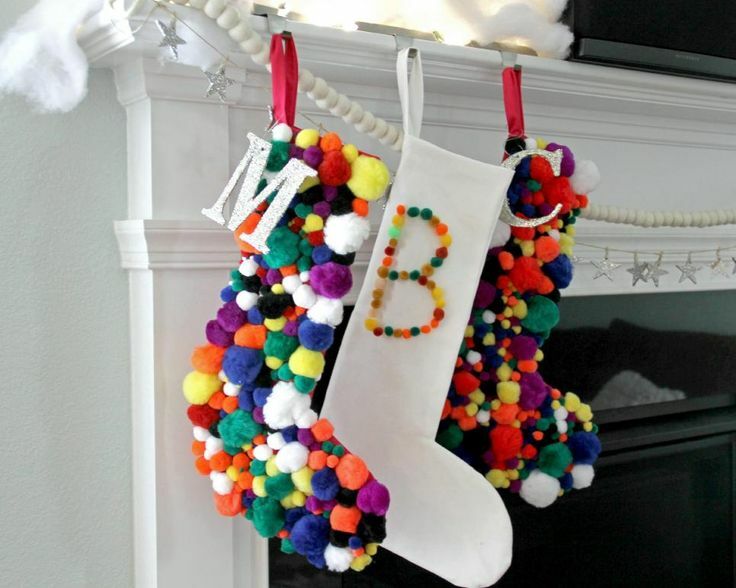 You only need cotton stocking, pompoms of various color and size, fabric glue and tin foil. You can use less pom poms if the previous project felt a bit too much. 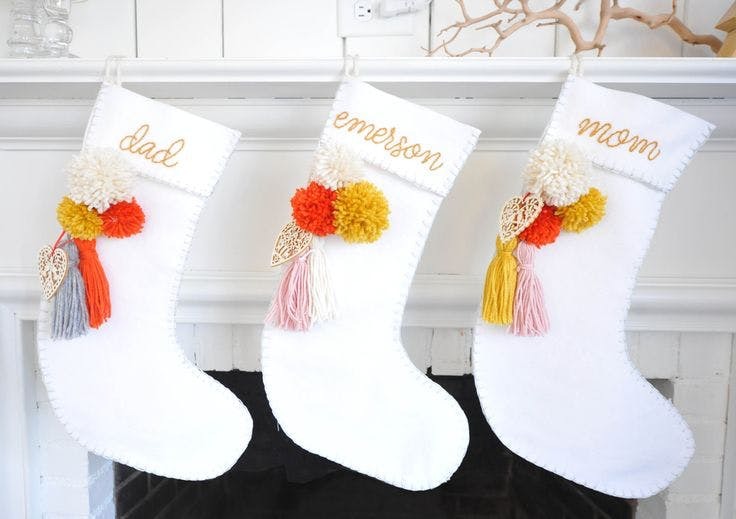 In fact, instead of putting pom poms all over, you can make personalized stockings. This way you every person of the family will have their very own stocking! You need 2.5 yards of wool felt, silver embroidery thread, gold embroidery thread. yarn for tassels and pom-poms , scissors, size 20, Chenille needle and sewing pins. Aren’t these super cute? There’s no way that these stockings will go unnoticed. So, for these cuties you need just four materials – felt, fabric, buttons and free templates that you can download from the website shown below the picture. Make sure you own basic DIY tools as well, such as needle, thread, glue and scissors. Create something out of the box – instead of the regular red, green and white stockings, how about creating indigo blue? And, unlike most of the projects on the list, this one includes working with cookie cutters, except there’s no food to make a mess around! 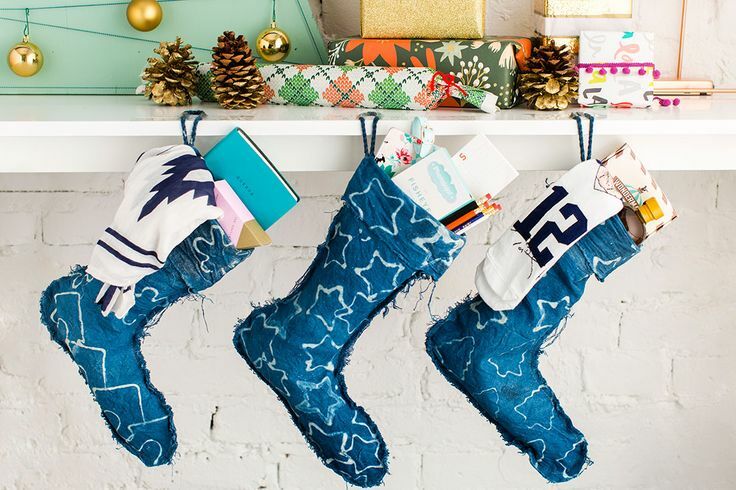 Besides the cutters, you need indigo tie dye kit, candle wax and canvas stocking. It’s amazing how different types of fabric can create such beautiful, vibrant Christmas atmosphere. 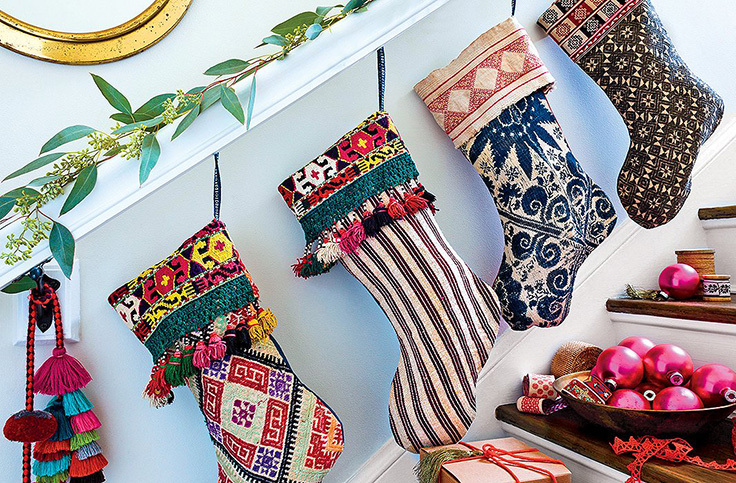 Putting stockings into a garland isn’t something new, but it’s something that works every time. For this project you only need fat quarters of Christmas fabric, stocking pattern that you can download for free from the website below, bakers twine and gold clips. 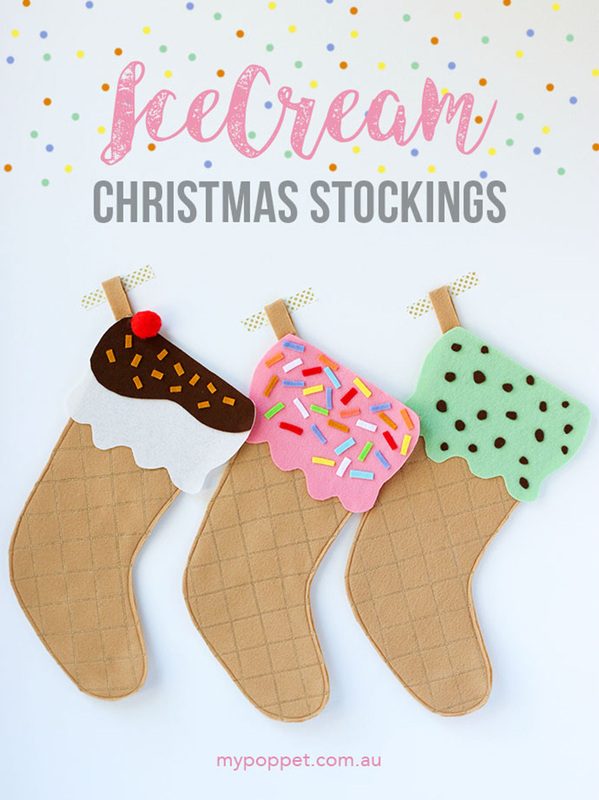 You’ve seen candy cane, snowflakes, ornaments, pom poms and springs on Christmas stockings, either as fabric pattern or real ones, but have you ever seen ice cream stockings? Ice cream might remind us of summer, but we have to admit that it looks so adorable! Don’t worry – the website below the picture offers free templates of both the ice cream and the stockings. We’ve already shown you ideas that included different fabric or colors, but now let’s move to the shape of the stockings. 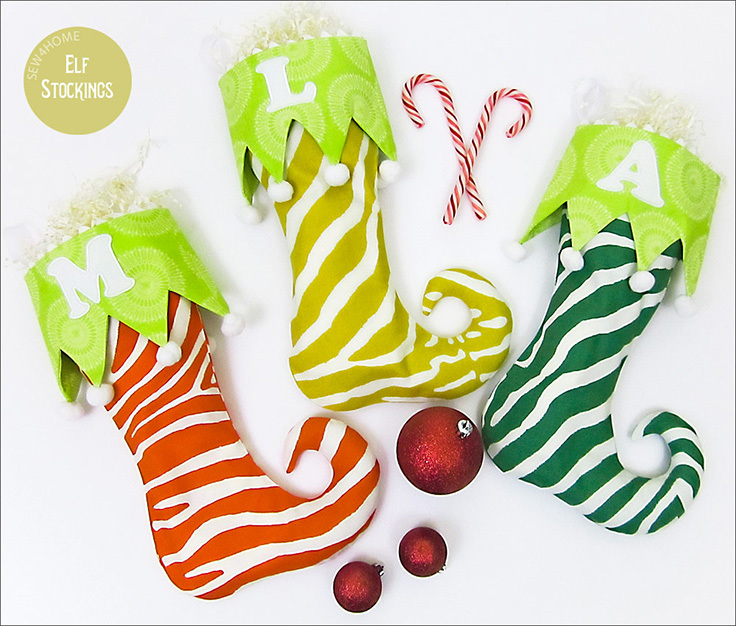 These elf stockings look absolutely amazing! The shape makes them so unique and they will be such a nice decoration to any room you place them into. However, note that these stockings require more than basic sewing skills and it might take you more time to create them. If you don’t know how to sew, your skills are too basic or you simply don’t like sewing crafts, here’s a solution you’ll like – instead of sewing, you can glue them. So, for this project make sure you have lots of felt in colors you like, hot glue gun and sticks, sharp scissors and various embellishments, such as pom poms, beads and ribbons. These stockings are so colorful and we must admit that the patterns are amazing! They don’t contain the typical Christmas theme, so if you feel like experiment a little bit this year then you should definitely give stockings a try. Again, it’s all about the fabric – it truly does the magic! So, get the old fabric that is hanging somewhere unused in the house or buy new one, whatever your option is and don’t forget to have fun!